Sikles Trekking is newly explored and virgin trekking routes in the southern Gurung settlement of Nepal above the Mardi Khola (1,980m) overlooking Annapurna IV to the north and Annapurna II and Lamjung Himal to the east. It boasts good mountain views and is unaccustomed for trekkers. It is a spectacular short trek and traverses a variety of terrain from low land villages and rich terrain up to Nepali’s largest Gurung (Gurkha) village as well as blooming forests of rhododendron in the spring. The villagers follow with Shaman priest and Budhist priest in marriage, death and dealing with ill fate. The region is particularly good for bird watching because of its pristine forested surroundings where different species of birds thrive. 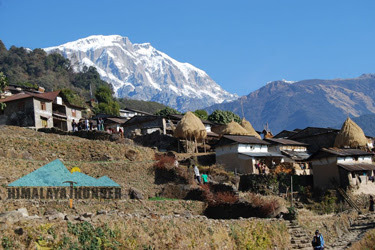 The trekking route offers wonderful views of the Annapurna and Manasulu ranges. Climbing though oak, rhododendron and bamboo forest and follow ancient trails to the Madi Khola valley and stay in the villages of Sikles, Tang Ting and Bhujung. This new trek offers a truly captivating village experience where we get to see the real rural Nepal. Trekkers can enjoy by camping at unique sites, eat the local dishes and witness daily life unfold around us.